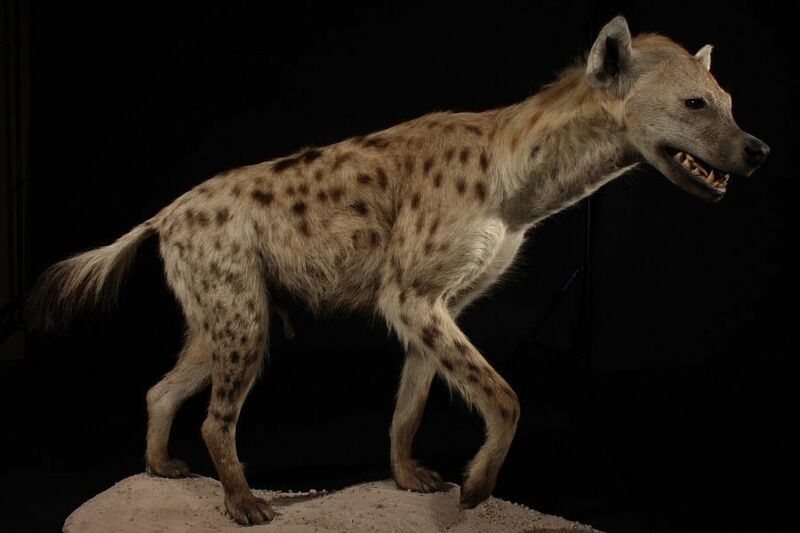 The spotted hyuena is the largest of the Hyena, it lives mainly in the African savanna. The origin of its name referred to the golden jackal, the first observations of the hyena described a mixture of a wolf and an African dog. It is recognizable by its short, rounded ears and its relatively long forelimbs. Its coat is sand color with black spots apart from other hyenas. 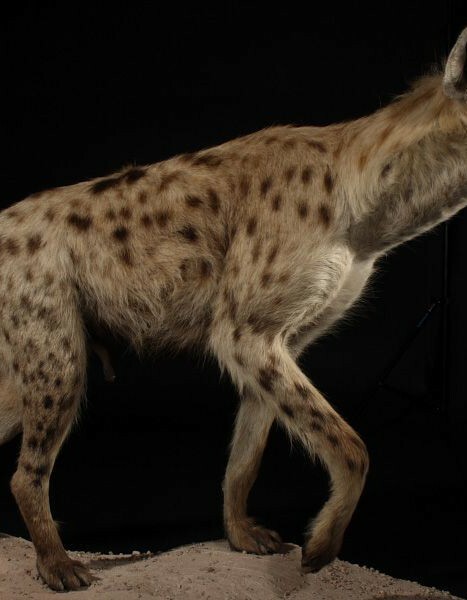 Its weight varies between 40 and 86 kg and its length can reach 1.60 m. In this type of hyena, the females genitalia are very developed to the point of resembling those of males disproportion. This is due to a much higher testosterone levels in females than in males. The females are larger and heavier than males. They are also more aggressive. The female dominates the group, which ranges from 5 adults in savanna rich in prey. The female has an average of two little who are born after a hundred days of gestation. She raises them without the help of the male. When they are a few months old, the little join a common burrow until weaning at the age of 15 months. The company is matriarchal. Females are dominant individuals and the hierarchical level is transmitted from mother to daughter. It broadcasts a wide variety of shouts and grunts to join the group or locate small. When excited, the spotted hyena emits a call that sounds like a sneer. Spotted hyenas are formidable hunters, scavengers and inveterate opportunists, they attack large prey like buffalo, zebra, antelope, eland, wildebeest, hartebeest, impala, waterbuck. It can consume 14 kg of food in one meal, however it is content of about 1.5 to 2 kg of meat per day. Its jaw is one of the most powerful of the carnivorous mammals kingdom. With their long legs and relatively thin body, hyenas are fast and endurance. The species is classified as Least Concern.